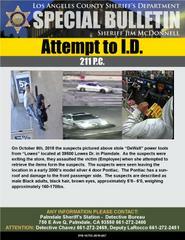 Palmdale Detective's Need Your Help Identifying These Two Robbery Suspect's. On October 6th, 2018, two suspect's (pictured in flyer) entered "Lowes" located at 39500 Lowes Dr in the city of Palmdale, walked down the power tool isle of the business, and stole "DeWalt" power tools. As the suspect's exited the store without paying, they were contacted by a Lowe's employee. Suspect #1 (described as a male Black adult, black hair, brown eyes, approximately 5'8- 6'0 tall, and weighing approximately 160-170 lbs, wearing a black hoodie/black shorts, balled his right hand into a fist in an apparent attempt to assault the employee. Suspect #2, (described as a male Black adult, black hair, brown eyes, approximately 5'8- 6'0 tall, and weighing approximately 160-170 lbs, wearing a grey hoodie/ blue jeans) knocked the employee to the ground, causing her to strike her head against a pole.